Today is 冬至 Dōngzhì (The Winter Solstice Festival), one of the most important festivals celebrated by the Chinese and other East Asians, a time for the family to get together. Many families are making and eating 湯圓 (汤圆 tāngyuán rice balls) which symbolize reunion. I didn't get a chance to eat 湯圓 today, I'll have to go to the Asian market to shop some. Here's a Children song "賣湯圓" ( 卖 汤圆 Mài Tāngyuán Selling Rice Balls ) I'd like to share with you. Thanks to Bananaz reminded me the song. The 小二哥 ( xiǎoèr gē, long time ago in China, people called the server in restaurants 小二 or 小二哥. 小二哥 is more polite.) in the video is cute. The way he throws the rice balls in the pot is pretty cool though it's probably edited. 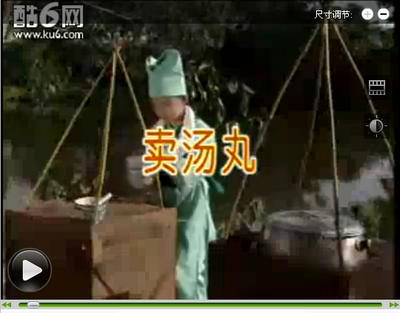 There's a white flag with "酒" ( jiǔ wine ) on it in the video. It means a place that serve food. In the beginning of the video, it says 卖汤丸 Mài Tāngwán. 丸 wán is also balls or pills. The server's rice balls are round and round. 小二 哥 的 汤圆 是 圆 又 圆Xiǎoèr gē de tāngyuán shì yuán yòu yuánThe server's rice balls are round and round. 我喜欢吃湯圓 Wo xihuan chi tangyuan! The photos of the tangyuan makes me hungry! haha! What's the meaning of "呀" in this sentence? Can I leave it out and just say 三 毛 钱 买 一 碗? Jeannie, Not too sure is this an idiom and if there is a story for this. 1. One kind of rice feed 100 kind of people. Yup, I was lucky that I was in Penang and have chance to eat Tangyuan made by my mum, which I have not taken for years. This time, I enjoyed it very much as my mum didn't cook as sweet as before. Hope you manage to find some in Asian Market. Thanks for sharing this lovely song. May 2010 bring you success, health, wealth, joy, happiness and everything you dream of, Jeannie. Thanks to all of you for dropping by. Kelvin, I hope it's helpful for you. Foong, somehow I can't access to your blog. We both like 湯圓, great! "呀" is just a particle with no meaning and yes, you can just say 三 毛 钱 买 一 碗.
Bananaz, 一樣米養百樣人 One kind of rice feed 100 kind of people is a proverb. Idioms usually have historic story background. I will pick an idiom for this month then. James, wow...glad you got a chance to eat Tangyuan made by your mom. Didn't have chance to get to market yet. Best wishes to the new 2010! Hi Jeannie, happy new year and the very best of 2010. Wow, I wish I can read and write Chinese. Took up French and German long ago but never thought of Chinese. I understand there's 7000 characters in the Chinese alphabets. And the media only use 3000? Anyway, you stay young, and keep a song in your heart and have a great new year. Best regards, Lee. Uncle Lee, thanks for visiting and commenting. 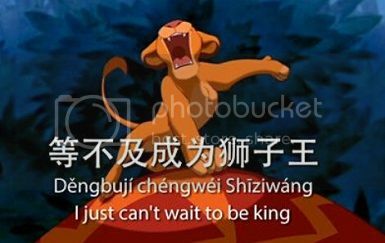 You can still start to learn Chinese if you like. Start from "Pinyin" which will tell you how to pronounce. I have a post about pinyin you can find it in the Labels in my side bar. There are 85,568 Chinese characters according to a Chinese dictionary "Zhonghua Zihai" and about 3500 to 5000 commonly used characters depending on different areas. Wish you the best and wonderful new year. Hope to see you often here. Cheers! I would like to assit to the festival this year. For a couple of year I couldn't go due to the fact I had a lot of job and also I get married, but this year there are not excuses to lose it.